For all those occasions when something special is needed. Elegant to look at and beautiful to hold, our hand-packed gift baskets are filled with high-quality gourmet foods and fresh fruit. When you send a gift basket you are certain to surprise and delight them! With all the favorites like fresh fruits, chocolates and cheeses, it’s a classic example of just how great a basket can be. Apples, bananas and pears, along with cheeses, chocolates and crackers, arrive in a wicker basket with handle, tied with a bow. 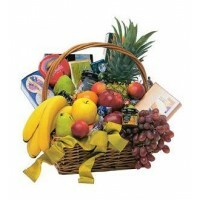 Exact basket, fruit, and gourmet se..
As the family welcomes loved ones into their home, this bountiful fruit basket offers your caring support in a tangible way. 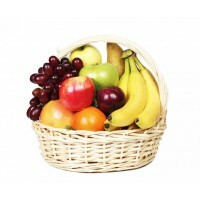 A wicker basket arrives filled with fresh apples, oranges, grapes, bananas etc. Exact basket and fruit selections may vary by season and delivery locatio..
You could satisfy the sweet tooth of everyone in the office with this bucket of great treats that everyone knows and loves. (And craves, too.) 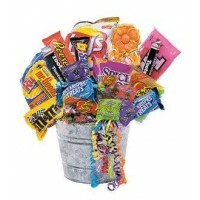 Candy bars, lollipops, jellybeans and more arrive in a galvanized tin bucket decorated with bright curling ribbon. Deluxeand Premium versions will be a .. 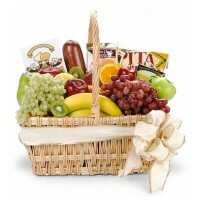 Perfect for any special occasion, this traditional basket is filled with an abundance of fresh fruits and snacks. Our designers fill a wicker basket with hand-selected fruit such as apples, oranges, and grapes, cheese, crackers, and chocolate make the basket complete. Exact basket, fruit, and gou.. Filled with delicious snacks and sweets, our popular Sweet Treats Basket is the perfect gift for students, employees, or anyone who deserves an extra special indulgence. 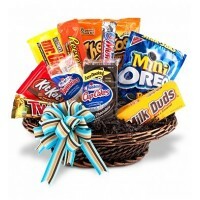 We fill a wicker basket with time-tested favorites such as assorted candy bars, cookies, pretzels, candy, chips and more. When ..